Falcons and caracaras have a complicated relationship with humans. In ancient Egypt they were deified in the form of Horus, the sky and sun god who was the ancestor of the pharaohs. Caracaras also formed part of the legends of the Aztecs, and are today the national emblems of Mexico. Falcons were important in the (formerly often royal) sport of falconry. They have also been persecuted for their predation on game and farm animals, and that persecution has led to the extinction of at least one species, the Guadalupe caracara. Several insular species have declined dramatically, none more so than the Mauritius kestrel, which at one time numbered no more than four birds. 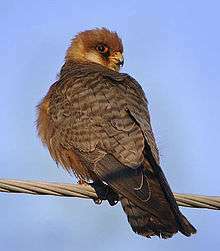 Around five species of falcon are considered vulnerable to extinction by the IUCN, including the saker falcon. First, multiple lines of evidence in the 1970s and 1980s suggested that the New World vultures Cathartidae were closer related to storks and herons (Ciconiiformes), though more recent place them outside that group as well. Consequently, New World vultures are now often raised to the rank of an independent order Cathartiformes not closely associated with either birds of prey or storks or herons. In 2007, the American Ornithologists' Union's North American checklist moved Cathartidae back into the lead position in Falconiformes, but with an asterisk that indicates it is a taxon "that is probably misplaced in the current phylogenetic listing but for which data indicating proper placement are not yet available". 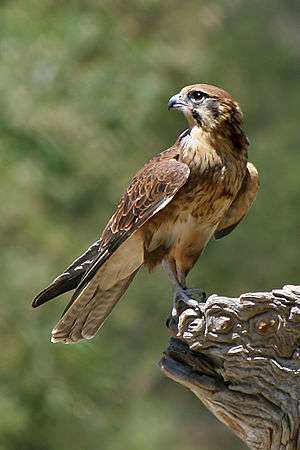 In agreement with the split of Falconiformes and Accipitriformes, comparative genome analysis published in 2008 suggested that falcons are more closely related to the parrots and passerines than to other birds including the Accipitridae, so that the traditional Falconiformes are paraphyletic even if the Cathartidae are excluded. Indeed, a 2011 analysis of transposable element insertions shared between the genomes of falcons, passerines, and parrots, but not present in the genomes of other birds, confirmed that falcons are a sister group of the combined parrot/passerine group, together forming the clade Eufalconimorphae. ↑ Tordoff, Andrew (2002). "Raptor migration at Hoang Lien Nature Reserve, northern Vietnam" (pdf). Forktail. 18: 45–48. ↑ Mikula, P., Morelli, F., Lučan, R. K., Jones, D. N., & Tryjanowski, P. (2016). Bats as prey of diurnal birds: a global perspective. Mammal Review. ↑ Collopy, M.W. (1977). "Food Caching by Female American Kestrels in Winter". Condor. 79 (1): 63–68. doi:10.2307/1367531. JSTOR 1367531. ↑ Ille, R.; Hoi, H.; Grinschgl, F.; Zink, F. (2002). "Paternity assurance in two species of colonially breeding falcon: the kestrel Falco tinnunculus and the red-footed falcon Falco vespertinus". Etologica. 10: 11–15. ↑ e.g. Ericson et al., Diversification of Neoaves: integration of molecular sequence data and fossils, Biol Lett. 2007 Jun 22;3(3):257-9. ↑ American Ornithologists' Union (2009) Check-list of North American Birds, Tinamiformes to Falconiformes 7th Edition. ↑ Suh A, Paus M, Kiefmann M, et al. (2011). "Mesozoic retroposons reveal parrots as the closest living relatives of passerine birds". Nature Communications. 2 (8): 443–8. doi:10.1038/ncomms1448. PMC 3265382 . PMID 21863010. ↑ Myers, P. R.; C. S. Parr; T. Jones; G. S. Hammond; T. A. Dewey. "Subfamily Polyborinae (caracaras and forest falcons)". Animal Diversity Web. University of Michigan. Retrieved 2009-08-15. ↑ "Check-list of North American Birds". North American Classification Committee. American Ornithologists' Union. Retrieved 2009-08-15. 1 2 "A classification of the bird species of South America". South American Classification Committee. American Ornithologists' Union. Archived from the original on August 1, 2009. Retrieved 2009-08-15. 1 2 Boyd, John H. "Falconiformes". Taxonomy in Flux Checklist. Retrieved 11 March 2016. ↑ Myers, P. R.; C. S. Parr; T. Jones; G. S. Hammond; T. A. Dewey. "Subfamily Falconinae (falcons)". Animal Diversity Web. University of Michigan. Retrieved 2009-08-17. ↑ "Check-list of North American Birds". North American Classification Committee. American Ornithologists' Union. Retrieved 2009-08-17. ↑ PVPH 465: a phalanx 1 of the middle toe. A caracara? Possibly belongs in extant genus (Kramarz et al. 2005).